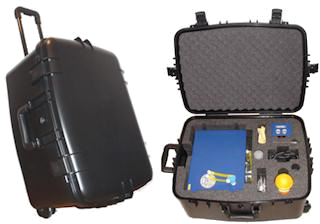 Compact & Portable! Overall dimensions 15"x11"x7". Visualize flow streamlines at various flow speeds and direction. Ability to vary flow speed dynamically studying flow speed effect on flow phenomena. 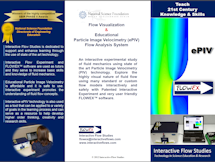 Fluid mechanics principles can be studied with different flow model inserts. Includes 6 flow model inserts. User can design custom Flow Model Inserts. Global Flow Field Velocity Measurement with particle image velocimetry. Ability to increase the PIV seeding density on the fly. 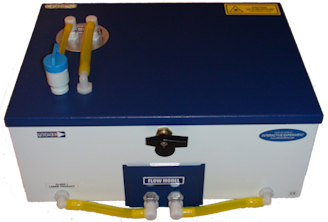 Safe and robust with fully enclosed water cooled laser. Reynolds number under 100 based on water flow through a 25mmx5mm flow model insert channel. Typical instrument set up arrangements suitable for classrooms and laboratories. the ePIV brochure (2.7MB PDF). the published papers, videos and posters. ePIV is ABET accredited at University of Iowa. Foam compartments for ePIV and all its accesories.